This postcard, which dates from about 1960, isn’t as old as many in this series of articles, but it’s one with an interesting story. 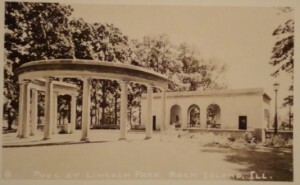 Identified only as “Lincoln Park,” it really shows the Denkmann Memorial Pool House within that park. This is from the personal collection of preservationist Shannon Hall. We thank him for so generously sharing his archives for these stories. 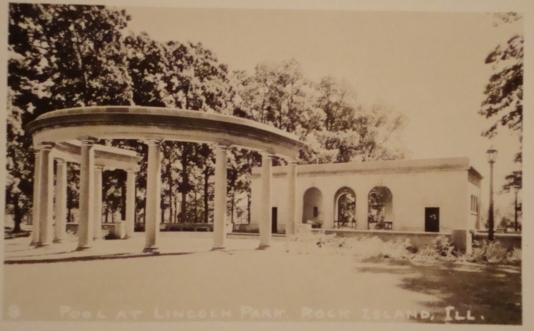 For decades, Lincoln Park has had an important cultural and recreational impact on the city of Rock Island as well as on its immediate Keystone Neighborhood. Some have claimed that the park was named in 1909 in honor of the 100th anniversary of Abraham Lincoln’s birth, but as late as 1912, it was still called East End Park. And even though it was called a park, it took years for it to truly become one. In the early 1920s, Augustana College offered to buy the raw land for expansion. There were no park benches, and the main geographic feature seemed to be a natural stagnant pond. The only improvement was a single light pole. Even Mayor Harry Shriver admitted he’d never been there. But citizens rose to oppose the sale, insisting that the park not only be saved but be improved. The park was not sold, but it took some years before the park board would have funds for significant improvements. In 1928, Davenport landscape architect Russell L. McKown presented the board with long-range plans — intended to take 10 –15 years to implement — to develop and improve the park. One of the first improvements was to add as much as ten feet of fill over the entire lower area to provide flat spaces for playgrounds, tennis, rolle bolle, horseshoes, and croquet. The required fill would come from another McKown proposal. He planned to grade a hill to create an outdoor amphitheater that would seat as many as 5000 on a long grassy slope. He also planned to convert an existing wading pool to a sand play area and use $10,000 recently donated by Frederick C. Denkmann to build a new wading pool with dressing rooms. McKown also included a rustic shelter with a connecting pergola. Finally, the plans called for a Davenport memorial fountain to be built within the next few years and, in the more distant future, a series of connecting pools forming rock and water gardens. Such a feature is similar to the series of ponds which rippled down the hillside in Long View Park. The ultimate development of Lincoln Park and its pool owe a great deal to the Great Depression and to Mrs. Frederick Denkmann. When her husband died, she upped his donation, offering to pay the full $45,000 cost of a more elegant wading pool as a memorial to him. Architect Benj. 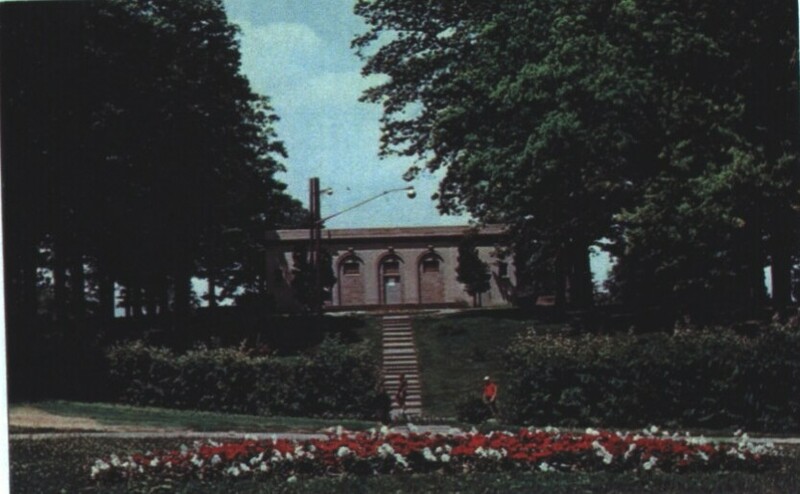 A. Horn of Horn and Sandberg was retained to design the elegant Bedford stone dressing room and shelter building, which the postcard shows viewed from the south. On the north side was a 30 x 30 wading pool, with a depth ranging from six inches to nearly three feet. Beyond the pool was a semicircular set of Greek columns called a peristyle. The dedication of the pool was scheduled for late afternoon on September 12, 1930, so school children could attend. But since Mrs. Denkmann did not wish to deprive the city’s children of the opportunity to play in the cooling waters, the pool actually opened in early August. In the early 1930s, much other work took place. The amphitheater, north of the Denkmann pool, was built, by grading a “hogback” hill between two ravines. Playgrounds and tennis courts as well as parking lots were created to the west. Most of this labor came from otherwise jobless men, employed under federal programs. Plans were also made to create a sunken garden south of the Denkmann pool house with shrubbery and perennials, all tagged with their names so an educational “arboretum” would be available to schoolchildren. This postcard shows the sunken garden, but the plantings have been simplified to rows of shrubs in the background with colorful perennials near the photographer. The Denkmann Memorial Pool was closed in the mid 1940s and the pool house sat unused. Twenty years later it was rediscovered by the Genesius Guild, the local theatre troupe that has brought open-air classical theatre to the Quad Cities for over fifty years. The Guild claimed it as a permanent home and,over the years, added a stage, lighting, and sound amplification as well as a more recent improvement — comfortable seating. Structurally there have been minimal changes. The pool is stlll there, but waterless; the Greek columns still embrace it. Genesius Guild’s free performances are held on Saturday and Sunday evenings during the summer and are open to all. Check their website www.genesius.org for more information. This article by Diane Oestreich is slightly modified from the original, which appeared in the Rock Island Argus and Moline Dispatch on July 28, 2002.